The London Wine Fair 2014 – after the hangover! It’s now a couple of weeks since The London Wine Fair, so what did we all think? This was WineEmotion’s first visit to London Wine Fair and resulted in us attempting to try all of the 10,000 wines on offer but failing miserably after only the first few! This year the exhibition was restored back at Olympia, returning to its roots. This wonderful venue offers grand surroundings for wines from all over the world to be showcased in London’s finest and most traditional of exhibition halls. 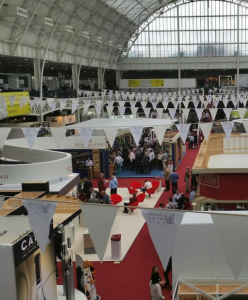 Geared towards the wine trade in all its capacities, The London Wine Fair sees exhibitors from all major importers, retailers, wholesalers and many niche and specialist importers. This meant that London Wine Fair offered WineEmotion the chance to meet and discuss with the trade their thoughts of wine dispensing and preservation. We saw it as the perfect opportunity for a reconnaissance mission, rather than a tasting journey (for a change!). Networking at an event of this size is a challenge, but one we certainly relished. So, what did we think? Wine, Wine, Wine and …. More wine! The 2014 London Wine Fair not only sees the return to Olympia but also has a new look and feel. I’m sure most exhibitors will be looking back and thinking London Wine Fair 2014 was a great success. With over 11,000 visitors, more exhibitors and increases in the key areas of on-trade and independent retail it has really built on previous success but I’m unable to see how 2015 could possibly be better?! What a great selection of wine there was to see and taste this year. My particular favourites are Malbec and Pinot Noir and I certainly was not disappointed with some real gems found. It’s like going to heaven for some wine connoisseurs … ‘Why is it only 3 days, I’m never going to get around!’ was the lament; I replied suggesting he visits ProWein in Dusseldorf, where it’s possible we wouldn’t see him for weeks! If we’re being honest we were a little disappointed not to see any wine dispensing equipment at the show, maybe our expectations were raised from visiting other exhibitions around the world where the wine dispensers are more prevalent. However, this will be rectified next year I’m sure. We were also expecting to see more wine dispensing systems on the producer and merchant stands (in partnership) but maybe as this is a short event over 3 days the requirement is simply not there. Indeed, some stands were getting through their featured wine very quickly so the wine dispenser is not required. The draw of guided tastings by some producers on their stands can make for a funny spectacle. We roller-coastered from concern through humour whilst watching the high-heeled stumblings of an over enthusiastic listener, wine glass in one hand, mobile phone in the other, perched precariously on the edge of the raised floor of the packed-out stand! This is just one memory of a wonderfully interesting and fulfilling day as a visitor at a prestigious Wine event. Next year, who knows where it will lead.